To progress, you always need to make some changes to your training plan, or completely change it. The thing is that not only the muscle fibers, but also the whole human body can adapt to various environmental conditions, including regular increased loads. But how to understand that the program no longer works and need to make any changes? Let’s talk about this in more detail. Krepatura – a concept that characterizes muscle pain after prolonged muscle activity in the similarity of training in the gym. It is believed that the main cause of muscle spasms is the release of lactic acid, then the level of strength during exercise there is a toxin in the muscles, which causes pain the next day. However, another important factor that causes muscle pain is a microtrauma of the muscle fiber, which appears as a result of heavy physical exertion. This factor is the most important lever for the growth and strengthening of muscle tissue. Everything is quite simple. During the load that you get in your workout, there are micro-breaks in muscle tissue. Do not be afraid of this, since it is these micro-breaks that cause our body to throw all its resources (nutrients) to restore and strengthen (thicken) muscle tissue. And so time after time, you tear, our body restores and thickens the fabric so that such tears of the fabric will not happen again. In turn, we change the training plan, increase the working weights and again cause muscle microtraumas. Let’s look at a vivid example to finally understand everything. Surely each of you noticed when you come to the gym for the first time or after a long break, the next day, after a hard workout, your body is sore. This is the pain, pain in the muscles. This happens due to the fact that the muscles have become unaccustomed to loads or are not adapted to them at all, which is why this inadequacy manifests itself in the form of pain in muscular tissue. However, it is worth going to the gym for another 1-2 weeks, as you notice that after each workout the pain subsides. This means that your body gradually adapts to the training. If the pains completely stop, most likely you are either poorly trained, or your muscle tissue is completely accustomed to such loads. In this case, you need to make changes to your workout. As can be seen from the graph, at the first classes, the pre-fabrication is strong enough, but after a certain period of time the painful sensations are no longer the same. WHY DO I NEED TO CHANGE THE TRAINING PROGRAM? As we said earlier, when microtraumas occur in muscles, our body switches on a self-preservation mode by restoring muscle tissue and thickening it, so that next time, during exercise, the muscles do not tear. That is, over time, the muscle tissue thickens, and the fibers are no longer susceptible to tearing under the old load. In order to continue micro-breaks further, it is necessary to change the program, make some changes, up to the selection of a completely different training plan. How often do I need to change the training program? The average adaptation period for people with different physical training is different. For example, for beginners, the average duration of using the same program ranges from 2-4 months, for more experienced athletes from 2-3 months, and for advanced athletes, this time period is reduced to 4-6 weeks using the same plan. That is, the higher the level of physical fitness, the easier and faster the muscle tissue adapts to one or another form of exercise. In addition, the entire program should be subject to change, and not a separate part of it. That is, there are two types of human physical activity: aerobic and anaerobic. The first kind implies a long-term physical activity, using oxygen as an energy source, it can be a long-distance run and various aerobic exercises. The second type implies a short-duration load, for example, performing some basic or isolating exercise. If in the first case, the body uses oxygen as energy, in the second it resorts to using short-term energy sources, such as: ATP molecules, glucose, glycogen, and so on. So, if you perform both aerobic and anaerobic training, then both types of load are subject to change. Many make changes only in the power part of the plan, arguing that how can you make changes in cardio? It would seem that all is true, if in the power section you can change the load, insert some new exercises into the program, and so on. What about cardio? How can jogging be made more diverse? The fact is that, as in the power section, there is a lot of exercise in aerobic exercise, a large number of variations in the performance of the load, and so on. For example, there is such a type of cardio, called interval cardio, in which the duration of the workout is much less, but the effectiveness, both in gaining muscle mass and in burning excess fat, is not changed. Yes, yes, you heard right, aerobic exercise can be performed in both cases, regardless of whether you are gaining muscle mass or burning excess fat. You can read more about this topic by clicking here on this link. As mentioned in the beginning of the article, our body gets used to any kind of load, including a long run on a treadmill. On average, the body needs approximately 1-2 months of training to adapt to a long run. In the process of habituation, the body begins to spend fewer calories, because of which the effectiveness of cardio decreases, if not to make any changes and additions. WHAT TO CHANGE: WORKING WEIGHT OR TRAINING PROGRAM? There is a situation in which you need to decide what to change, the weight or the program itself. Here things are in this way. If you have the opportunity to slightly increase the working weight, you need to use it. The fact is that muscles, it’s just fibers that stretch and contract, they don’t know what program you have, they don’t really care, the main thing is to increase weights. The load increases, the muscles are again torn and grow in even larger volumes. As soon as you notice that muscle pain after a workout slowly subsides or stops altogether, you need to increase the weight, if, of course, you have such an opportunity. That is, there are such situations that a person stops progressing, it seemed, you need to increase weights, but the power does not allow it. In other words, by increasing the weight by a couple of kilograms, a person cannot lift a shell and make as many approaches as he intended. Plus, the technique is broken, which can cause injury to joints, ligaments, sprains and so on. In this case, you need to slightly adjust the program, perhaps some kind of muscle that is involved in an exercise is lagging behind and it needs to be given more time. 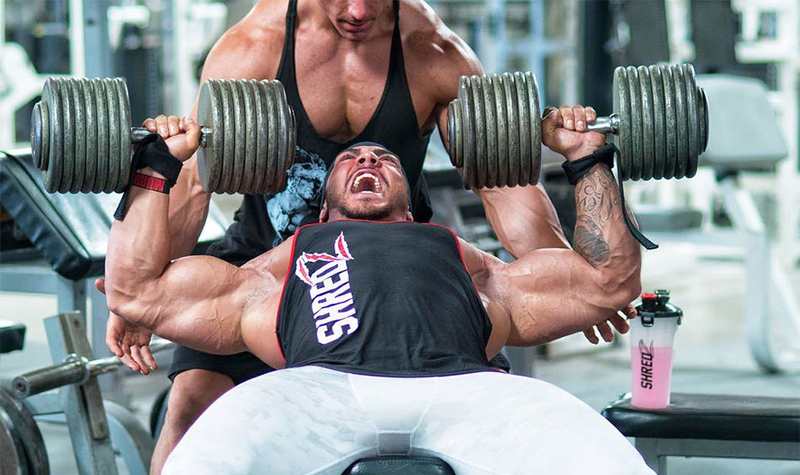 For example, you have stopped growing power in the bench press, and so that you do not do, stagnation continues. In this case, you need to resort to a small study of human anatomy. A large number of muscle groups are involved in the press, the triceps and the chest take on the main load. If you have ceased to grow strength in this exercise, perhaps the muscles of the triceps are a little behind and their training should be approached more seriously. And so, with each basic exercise. Therefore, if you have stopped progress, you need to increase the weight. If this is not possible, you need to change the training program itself, complementing it with some exercises. Here you need to think carefully, as was said in the example. Maybe there are some lagging muscles that should be given special attention or even set aside a separate day to work them out. One thing is for sure, you should always experiment and not linger on one program. There are several main reasons for which you need to make changes or even change the training program and now we will consider them. One of the most significant reasons that directly affects the training plan is the goal of the workout. The goal depends on which training method you will use. There are many ways to conduct your classes depending on your intentions, for example: pumping, supersets, circuit training and so on. Suppose you trained to the mass and wanted to lose weight. To do this, you need to make drastic changes in your training diary, since the work of the training program for the mass and the program for relief are significantly different from each other. The second important factor relates to a person’s lifestyle. Not everyone has the opportunity to train every day, but someone in general does not have time even for several trainings a day. You have to adjust your program to your daily routine. For example, if a person has the opportunity to visit the gym 2 times a week, you need to make a split, in which you can have time to work out all the muscle groups. That is, one day to combine the training of several muscle groups, and the other to bring training to the remaining muscle groups. If you have the opportunity to visit the hall at least four times a week, and you want to gain weight, you can use a four-day split to weight and so on. In general, the daily routine and lifestyle of a person plays an important role in building a training plan. Training in the gym should not be monotonous. Routine can get bored very quickly, and accordingly, any desire to engage in it disappears. In this case, if physical activities do not bring the former joy, energy charge, positive, it is necessary to change the training plan as soon as possible. It’s quite simple, if you want to progress, you need to change the training program at least once every 1-3 months. Even if the program is very effective and there seems to be positive results, as mentioned above about the routine, everything can get bored. And if there is no desire to go to the gym, the charge is lost, then what kind of progress can we talk about. Always focus on your goals, listen to your body. If you notice that the power indicators, muscle mass ceased to grow, you need to definitely change something. That’s all, all good luck on reengineering!